When I finished God of Clay by Ryan Campbell, I described the experience as "satiating something I was hungry for." And usually when I read genre fiction, I have to take bits and pieces of things I want from the books I read and make compromises. "Well, this book had gay protagonists at least, even if the conflict didn't let you forget that, and the characters paid for it." Or "this book has people of color as opposed to the assumption of a main character's innate whiteness, but it is overshadowed by western mores and still exhibits egregious exoticism." Or "well, there's a woman over 40 who plays a significant role, but she's more or less window dressing." God of Clay, on the other hand, was a buffet of the things I was hungry for: colorful sensory splendor; anthro and human presence; smart character decisions the fueled further conflict; a non-white cast of main characters; gay protagonists with sexuality not intrinsically tied to the main conflict; a world where you can still be older than 40 and be a woman and make life changing decisions for yourself and your tribe. See also: Review by Fred. Sofawolf Press, September 2013, trade paperback $17.95 [on Amazon] ( + 259 [+ 2] pages), Kindle $7.99. Illustrated by Zhivago. Clay's village is a living, breathing unit where the actions of every person matters. The gods feel like gods as opposed to humans with special powers -- they sense the world differently, are subjected to different limitations outside of their realms, and their jealousy is distilled horror. You can feel the age and the hardness in their cruelty, and Doto's personal transformation chills us to the core and reminds us how lucky we are to feel, and to understand feeling. It's rare enough to see fantasy epics that are not set in a reductive interpretation of Medieval Europe, but the book achieves what it sets out to do and more by utilizing the underused setting of Africa and immersing us in not just the rituals or the opulence but also day-to-day chores and ablution. The personalities of these characters shine bright, like a massive bonfire. You will see how evil spawns from endless justification. You will feel the weight of difficult decisions cast. You will laugh at a child-like god. You will also never look at your food the same way again after you cook it on the stove. 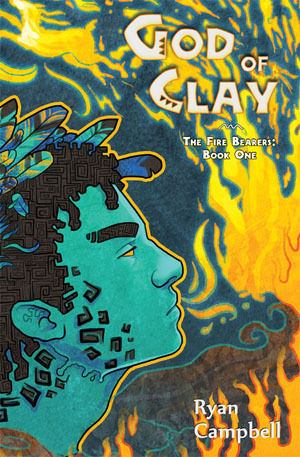 God of Clay shows how furry writing is maturing, is slowly establishing itself as a meta-theme or subgenre that started from the same humble beginnings as science fiction. It is the first book of Ryan Campbell's trilogy of The Fire-Bearers, and it is a must read. George Squares is a fiction, poetry and nonfiction writer who has been published in several short story anthologies. He also reviews, and enjoys looking for the implicit questions that furry fiction can ask.